Steinbrenner students and teacher John Vona pose with their district PTA Reflections awards. A number of students were invited to advance to the state award ceremony. When senior Sadie Testa-Secca sent in her piece of writing to a national competition, she was optimistic, yet reserved. She wasn’t sure what to expect. But after a few months of waiting, she had her answer. Every year, the Hillsborough County PTA, and the Florida PTA, participate in the National PTA Reflections Art Program. This competition is designed to target creative high schoolers across the country with categories such as dance choreography, literature, photography, and music. The competition happens in stages, wherein competitors must be victorious at one level to move on to the next one. District finalists, that is, students who won in categories at their individual schools and advanced to compete with other students in Hillsborough County, were invited to Jefferson High School on Jan. 13 for the Reflections Awards Celebration. This year, a number of Steinbrenner students were invited to attend this event, many advancing on to the state level of the competition. The 2018-2019 school year is the 50th anniversary of the PTA Reflections Awards, and the prompt for students to follow was “Heroes Around Me.” Students were instructed to create a work inspired by this topic, and the Steinbrenner winners interpreted this prompt in a number of ways. 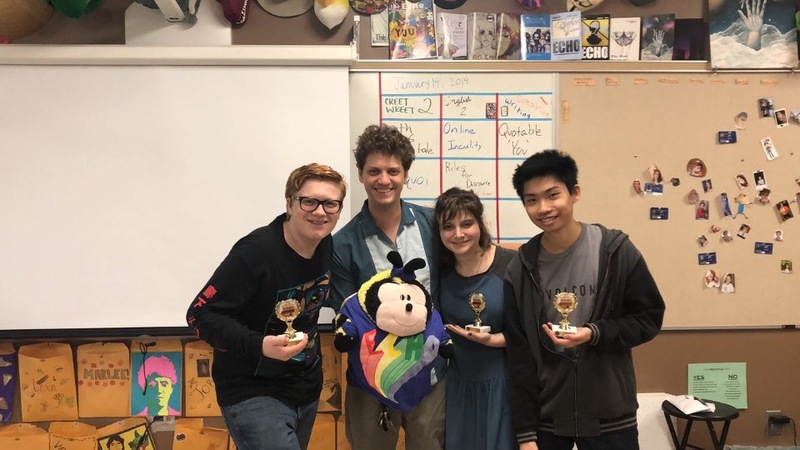 Noah Alewel, a senior at Steinbrenner, submitted a documentary for the film category of the competition, though he gave the prompt an interesting twist. Alewel and his team created a documentary about a pet fish dying suddenly, which, clearly, took on a more humorous tone than a regular documentary would. He was surprised to make it onto the state round, sure that a piece of such comedic quality wouldn’t be able to surpass more emotional. Matthew Lao, a junior at Steinbrenner will also be moving onto the state awards in Orlando in May. He won an Award of Excellence in the literature. Lao, like Alewel, was pleasantly surprised to learn he had advanced on to the state level of this competition. Especially, he explained, because he tends to focus more on longer pieces of work, and his submission for the competition was a poem. However, he selected a poem because he felt it would better fit the prompt. The Steinbrenner students advancing to the state level have been invited to attend the award ceremony in Orlando on May 4.